Are the dreaded Check Engine Lights on again? If so, are the frequent trips to the mechanic heavily costing you your valued time and money? Well, INNOVA 3123 GM OBD1 Code Reader can help you clear the Check Engine lights effortlessly. INNOVA 3123 GM OBD1 Code Reader is an effective code reader for DIY for obvious reasons. This tool is a must-have obd1 scan tool that can help you deal with the Check Engine Lights. The best part is that you do not have to be a professional tech to read and clear codes using this OBD1 scan tool. This is because INNOVA 3123 GM OBD1 Code Reader allows you to retrieve codes and subsequently defines the codes. And how does the code reader works? INNOVA 3123 GM OBD1 Code Reader uses a simple principle to read codes. Whenever you connect it to your vehicle, it accesses the vehicle’s onboard computer and retrieves Digital Trouble Codes ( DTC). You will see that the codes are displayed and subsequently explained on the screen. As a result, this code reader is popular among the average vehicle owners, car enthusiasts, and DIY who wants to read and clear codes. INNOVA 3123 GM OBD1 Code Reader is multilingual. This code reader is specifically designed for diagnosing most domestic General Motors trucks and cars manufactured from 1982 to 1995. You can retrieve ECM and ABS codes on GM domestic vehicles that were manufactured before 1995. INNOVA 3123 GM OBD1 Code Reader is also compatible with windows software. Although you cannot update INNOVA 3123 GM, you can easily connect to your PC for enhanced user experience. The simple to use INNOVA 3123 GM OBD1 Code Reader allows you to read codes from its screen. The moment you connect this code reader to your vehicle onboard computer, it displays a blinking light as a sign of on-going diagnosis. The retrieved codes are displayed and defined on the screen. Once the problem has been fixed, INNOVA 3123 GM OBD1 Code Reader has buttons that can help you reset the Check Engine lights. INNOVA 3123 GM OBD1 Code Reader is multilingual. It means that you can read the retrieved codes either in English, Spanish, or French. The software is compatible with most GM domestic cars as well as trucks. INNOVA 3123 GM OBD1 Code Reader is based on OBD I software. The software is compatible with most GM domestic cars as well as trucks. It can read and reset CEM and ABS codes on vehicles that were manufactured from 1982 to 1995. Most average car owners find this software incredibly easy to use as they can easily scan their vehicles accurately. 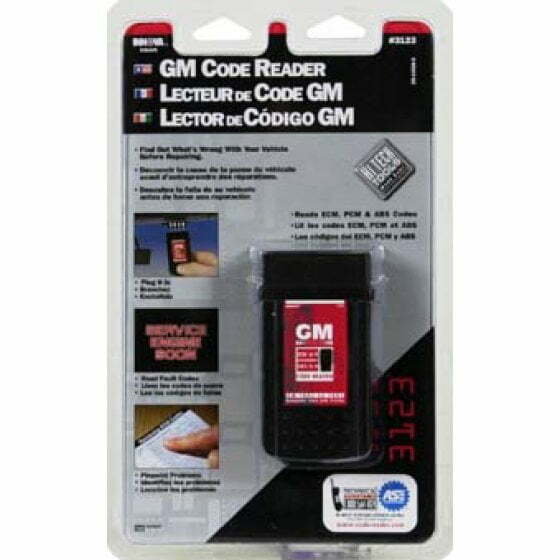 This scan tool is a trusted and a highly efficient GM code reader. It is very simple so as to allow average car owners to perform diagnostic functions that were previously reserved only for mechanics. Whenever you what to diagnose your car, all you need to do is use a cord to connect to your vehicle’s computer self-test connector. This helps the code reader to safely and effectively access the vehicles onboard computer to retrieve codes. It is possible to effectively read Anti-lock braking system (ABS) with INNOVA 3123 GM OBD1 Code Reader. This is a vital safety measure as you can avert possible accidents by reading and resetting ABS codes using this general motors code reader. INNOVA 3123 GM OBD1 Code Reader can retrieve CEM codes. 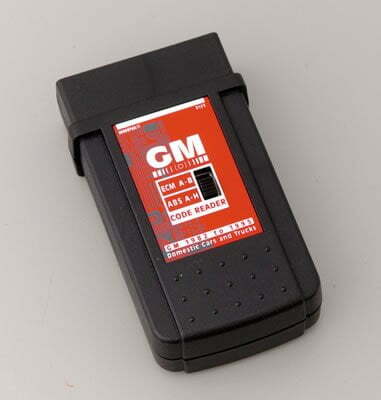 This is one of the GM obd1 code readers that can help you pinpoint CEM issues with high precision. It does not only read the code but also help reset the code once the problem has been fixed. It is possible to read codes in English, French, and Spanish using INNOVA 3123 GM OBD1 Code Reader. It is not only possible to retrieve codes using INNOVA 3123 GM OBD1 Code Reader but also it goes ahead and defines the codes. This functionality is important as you can effectively read the codes and explain what it means. This makes it possible for an average car owner who has no technical skills on car maintenance to diagnose their vehicles. This Innova scan tool is compatible with General Motors trucks and cars made from 1982 to 1995. Most of these vehicles are trucks and cars built with onboard computers. However, you cannot use INNOVA 3123 GM OBD1 Code Reader on vehicles weighing more than one ton. This is one of the code readers designed with portability in mind. It weighs 11.2 ounces and with dimensions of 10 x 2 x 6. Therefore you can take it wherever you go and do diagnosis whenever you want. INNOVA 3123 GM OBD1 Code Reader is a simple code reader that comes with great features and functionality. As a result, you can effectively scan your vehicles with a lot of ease. It is multilingual as it supports English, Spanish, and French languages. Can diagnose all electronic systems of a vehicle. INNOVA 3123 GM OBD1 Code Reader is an effective code reader for DIY for obvious reasons. To begin with, it is one of the code readers that is really simple to use. Besides, you can safely access the onboard computer of your vehicle to retrieve ABS and CEM code. If you are wondering about the price then take it easy. INNOVA 3123 GM OBD1 Code Reader is one of the cheapest code readers in the market. 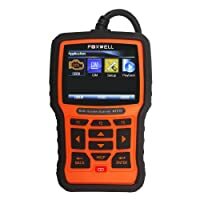 However, if you want to perform advanced diagnosis, Foxwell NT510 is the best scan tool to settle for. It is primarily designed for professional techs. INNOVA 3123 GM OBD1 Code Reader is a must-have obd1 scan tool that can help you deal with the Check Engine Lights. 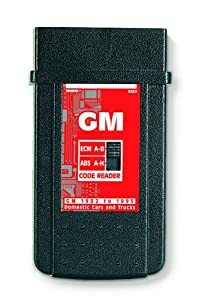 This General Motors code reader can help you save time as well as money as you can do for free what a mechanic would have done with a cost. Mechanics all over keep buying Launch CRP129 for a reason, it’s one of the best OBD2 scan tools. But how good is it? Read my detailed review NOW! !